My passion in life is helping people and societies to move from no to yes. As a negotiator, mediator and cofounder of the Program on Negotiation at Harvard University, I’ve spent more than four decades traveling the world and getting involved in some of the most difficult conflicts of our time, from the Cold War to the Middle East. One of my favorite negotiation stories is about a man who leaves his herd of 17 camels to his three sons as their inheritance. To the first son, he leaves half the camels; to the middle son, he leaves a third of the camels; and to the youngest son, he leaves a ninth of the camels. The three sons get into an intense negotiation over who should get how many, because 17 doesn’t divide by two, or by three, or by nine. Tempers become strained, so in desperation they consult a wise, old woman. She listens to their problem and says, “Well, I don’t know if I can help you, but if you want, at least you can have my camel.” Now they have 18 camels, so the first son takes half of them, or nine camels; the middle son takes his third, or six camels; and the youngest son takes his ninth, or two camels. Nine plus six plus two adds up to a total of 17 camels. There is one camel left over, so the brothers give it back to the woman. Many of our negotiations and conflicts today are like those 17 camels — they seem impossible to resolve, with no apparent solution in sight. What we need to do is step back from the situation, look at it through a fresh lens, and come up with an 18th camel.Finding that 18th camel in the world’s conflicts has been my life’s work. If you think about the human predicament today, we are a bit like those three brothers, because we are one human family. Thanks to technology, all the tribes on the planet can, for the first time, get in touch with each other. And the big question facing us is: How do we deal with our deepest differences, given the human propensity for conflict and the human ability to devise weapons of enormous destruction? We tend to see conflict as two-sided, and we frequently fail to see there is always a third side. Almost 30 years ago, I was invited to South Africa to do negotiation work. I decided to take an extra month to spend time with the San Bushmen of the Kalahari to study how they resolve conflicts. I was interested in them because, until not long before, they’d lived as hunters and gatherers, the way of life humans had followed for 99 percent of our history. For hunting, the San use deadly poison arrows. So what do they do when tempers rise and conflict threatens to turn destructive? As I saw for myself, someone first goes and hides the poison arrows. Then everyone sits down in a circle and begin to talk and to listen, often for days on end. They don’t rest until together they’ve reached a resolution or, better yet, reconciliation. And if tempers are still hot, one of the parties is sent off to visit relatives for a few months to cool down. I call this mechanism of community engagement in conflict the “third side,” and this system, I believe, is probably what has kept our species alive. We tend to see conflict as two-sided: labor versus management, husband versus wife, or Republicans versus Democrats. And what we frequently fail to see is there is always a third side: it’s us, the surrounding community, the friends, allies, family members, neighbors. When I returned to my work in South Africa after being with the San Bushmen, I saw with new eyes the third side in the bitter and violent conflict dividing that country. Business leaders, religious leaders, labor unions, women’s groups — in other words, the community — were working to transform the conflict. Nelson Mandela himself could be understood not just as a leader of one side, but as a third-side leader who also stood for the whole, who was fighting, as he expressed it so eloquently, for the freedom of the whites as well as the blacks. From the outside, the political transformation in South Africa seemed almost miraculous. Everyone was expecting bloodshed to continue forever, and the secret was the activation of the third side. The most fundamental way in which the third side can help is to remind the parties of what’s really at stake. When we are locked in conflict, it can be easy to lose perspective and simply react. Human beings are reaction machines, and as the saying goes, when you’re angry, you will make the very best speech you will ever regret. The third side can remind the arguing parties to go to a place of perspective — I call it the “balcony” — by reminding them to stop fighting and start talking, whether it’s for the sake of the children or the family or our community or the future. There’s an old saying that some conflicts are so difficult, they can only be healed with a story. My mind started racing: ”Puerto Rico? What do I know about Puerto Rico?” But I remembered just in time to get back to the balcony. So when he paused and everyone looked at me for a response, I thanked him for his remarks. Then I said, “I appreciate your criticism of my country, and I take it as a sign that we’re among friends and can speak candidly to one another. And what we’re here to do is not to talk about Puerto Rico or the past. We’re here to see if we can figure out a way to stop the suffering and the bloodshed in Chechnya.” The conversations got back on track. Most people wonder whether every conflict has a third side — surely, in the seemingly unresolvable conflicts in Middle East, there is no third side, right? I’d argue that there is. While I don’t claim to have the ultimate answer to conflict in the Middle East, I do have a first step to suggest: to take a literal first step. By understanding the story of the Middle East, we can figure out the third side. In short, the origin story goes like this: 4,000 years ago, a man and his family walked across the Middle East, and the world has never been the same since. That man was Abraham, or Ibrahim as he is known in much of the region. His basic message was of unity and of interconnectedness, and his primary value was kindness toward strangers. That’s probably what he’s best known for: his hospitality. In this sense, he’s the symbolic third side of the Middle East, because he’s the one who can remind us that we’re all part of a greater whole. There’s an old saying that some conflicts are so difficult, they can be healed only through a story.To use Abraham’s story as a vaccine against religious and ethnic intolerance, we need to bring it to life. A simple way to do that is to go for a walk in his footsteps. There’s something very special and powerful about going for a walk together. You’re usually side-by-side, moving in the same direction. Whoever fought while they walked? Maybe that’s why, in tough negotiations, sometimes the parties go for walks, like the famous walk in the woods during US-Soviet talks in 1982. 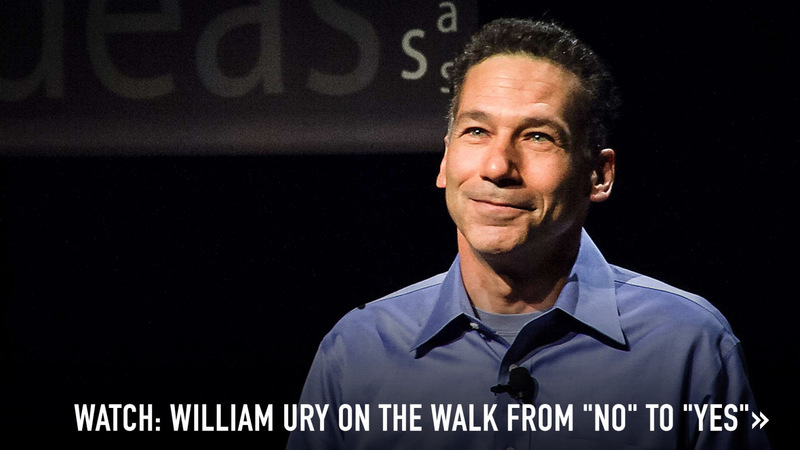 Walks can lead to breakthroughs — they are a way to go to the balcony and get some perspective. A struggle is going on between our technological genius for destruction and our social genius for cooperation and coexistence. This led me to the idea of opening up the ancient path of Abraham — creating a cultural route through the Middle East a bit like the Silk Road or the Camino de Santiago — that could serve as an unlikely and transformative meeting place for humanity. I told people, and many of them thought it was a crazy idea, of course. We studied the possibilities and logistics at Harvard for a year or two, and then, in 2006, a group of us from ten different countries and many different backgrounds decided to try it out — to retrace Abraham’s ancient journey from womb to tomb. We started in Urfa, in southern Turkey (formerly northern Mesopotamia), which is where people believe Abraham was born, and journeyed together to Harran, where, according to the ancient scriptures, he set off on his journey. Then we went to Aleppo, which, it turns out, takes its name from Abraham’s milking his goat to give to the poor, and then to Damascus, which has a long history associated with Abraham. We traveled next through the highlands of northern Jordan to Jerusalem and Bethlehem and, finally, to Hebron, the place where he was buried. It was an extraordinary and moving journey. As we discovered when we walked through these communities in the Middle East, Abraham is not just a figure out of a book — he’s a living presence, a symbol of hospitality. “In the name of Father Ibrahim, let me offer you some food” was a phrase that we heard. In places where you might expect hostility, we received the most amazing hospitality. No matter what divides us, we saw that what unites us is far greater. That’s the meaning of the Abraham Path. Since that first journey, over 1,000 miles of walking trails along the Abraham Path have been mapped out and developed. Thousands of people are walking, from local schoolchildren to expatriates to visitors from around the world. As unlikely as it may sound, with the wars in the region, more and more people are walking parts of the path every year. In a world where fear of strangers is on the rise, that’s what this most unlikely of paths is all about: building human connection and transforming fear into hope. And it’s not just people’s psychology that has been altered by walking the path; it’s economics as well. As people walk, they help create livelihoods for those who live on or near the path. That’s the long-term potential of the Abraham Path: to shift our view of the Middle East, to change the image we have from hostility to hospitality, from terrorism to tourism. It can become a global symbol of hope and unity. The world today is going through a period of intense polarization and political conflict, driven in part by the dizzying pace of globalization and the people who feel left behind. Whether it’s the bitter political divisions in the US or Brexit in Europe or the wars in the Middle East, conflict seems to be on the rise. In a larger sense, a struggle is going on between our technological genius for destruction and our social genius for cooperation and coexistence. What we need now is to awaken and mobilize our most ancient system for dealing constructively with conflict, the third side. Perhaps we could create a platform that allows everyone to become a peacemaker, a third-sider.After all, technological platforms like Airbnb permit anyone with an apartment or house to become an innkeeper; Uber enables anyone with a car to become a taxi-driver. Think of the third side as a social immune system that can swarm conflicts, just as our immune systems deploy T-cells to swarm infections. Third-siders could listen with empathy, and then bring people to the balcony so they can act appropriately to contain, resolve and prevent destructive arguments. The secret to peace is us, and each of us can take a single step to bring the world a step closer to peace. There’s an old African proverb that goes: “When spider webs unite, they can halt even a lion.” It’s time for us to bring our webs together. 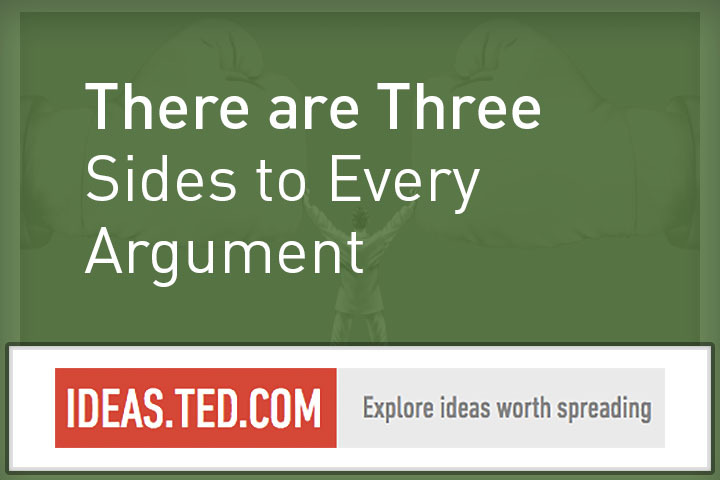 No Replies to "There are three sides to every argument"